Rubem Vitoriano is now part of the club’s maintenance staff. 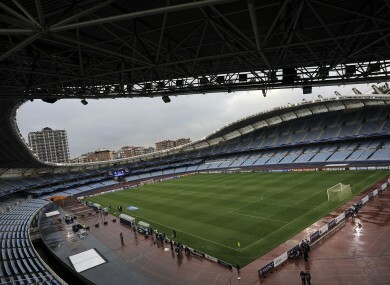 REAL SOCIEDAD HAVE given a homeless man who had been sleeping outside the La Liga club’s stadium a job on their maintenance team. Rubem Vitoriano, who has been sleeping on the streets of San Sebastian for the last three years, has signed a two-month deal with the club, according to Spanish newspaper Marca. For the last eight months, the 35-year-old and his dog had been sleeping at the gate’s of Sociedad’s Anoeta Stadium home but he has now been able to find a place to stay. The Spanish side have made a promising start to the season and sit seventh after nine games. Email “Real Sociedad employ homeless man who sleeps outside their stadium ”. Feedback on “Real Sociedad employ homeless man who sleeps outside their stadium ”.